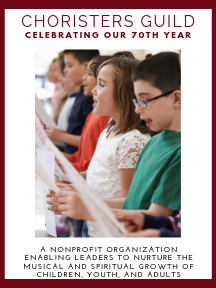 Get an exclusive, behind-the-scenes look at composing for children's choirs! Bestselling composer Mark Patterson will take participants through his compositional process for young voices, and along with Sacred Choral Editor Katie Houts, participants will explore the elements of an effective children's choral piece. A wonderful refresher on how to choose great music for your children, and an excellent learning opportunity for aspiring composers! Can't make the live session? Watch the recorded session at your convenience after the live event. Just register as usual. We will send a link to the recording to all registered participants after the live session ends. Webinars are FREE for Choristers Guild members, so be sure to log-in as a member in completing your registration. Non-members may participate by registering at the non-member rate of $30 per webinar. Member Webinar Pass Webinars are free to all Choristers Guild members. Non-Member Webinar Pass Non-member rate is $30 per webinar.